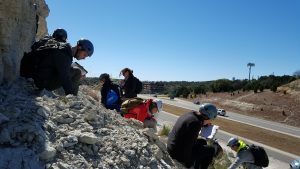 During the first two years of the EVS program, students take a field seminar (EVS 311) and research methods course (EVS 121) taught by top UT faculty, along with a signature course that provides an introduction to the academic and hands-on study of sustainability (Sustaining a Planet UGS 303). Through these three courses, students gain practical, hands-on experience in field-work studying aquifers, ecosystems, estuaries, and sustainable development. Port Aransas (UT Marine Science Institute). Through this hands-on experience, students gain an understanding of human impacts on the environment, the interdisciplinary nature of environmental analysis, and the range of environmental science and sustainability research at UT Austin. Writing. The focus is on writing formal English to convey information in an accurate, clear, and concise fashion (rather that writing to entertain or to persuade). This is the type of writing used in almost all scientific contexts, and it is also the primary type of writing required in almost all jobs in all fields. Data analysis, statistics. A brief introduction to a few useful methods in data analysis and statistics. These will be directly useful, and give a taste of what this aspect of science is like. Location and identification of documents on environmental topics. An introduction to the process of evaluating the reliability of documents and extracting information from them. Documents will include scientific research papers, government reports, and others. Outreach. A taste of what outreach to non-scientists is like and how to do it successfully. Networking. Identifying labs (or other situations) in which to pursue the EVS Capstone Research Experience and opportunities to meet UT environmental scientists while becoming more familiar with environmental science at UT.